Land Board chairman Yusuf Nsibambi. File photo. KAMPALA–The Kampala District Land Board and KCCA are again up in arms over control of the city land. The authority has this time around compiled a litigation report, accusing the board of illegal allocating of land to more than one individual, causing financial loses to KCCA. PML Daily this morning got a litigation report from the legal directorate of KCCA, with court cases the authority is fighting. Some of the cases, the land board is accused of, include allocating land to David Pila Oloka at plot 6 at Luthuli Drive, Kololo. This piece of land, according to the letter KCCA executive director Jennifer Musisi wrote to Yusuf Nsibambi, the chairman of the land board in March 2015, had been subleased to another individual. “This matter is now the subject of proceedings before the High Court,” she added. Other cases, Musisi cites include plot 24 Nakivubo land where KCCA holds 99-year lease but recently the board allocated it to third parties. Also High Court ordered KCCA in February KCCA to pay Shs600m for wrongly allocating plot 65/57 Seventh Street, Industrial Area, to a third party during the subsistence of a valid lease. With more than 100 individuals waiting to be compensated and others battling KCCA in courts of law, sources at High Court said KCCA needs sh40b, to clear them. 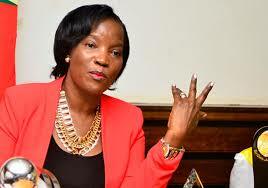 KCCA executive director Jennifer Musisi. File photo. But Musisi explained that the errors committed by the land board have adverse consequences on KCCA revenue. “The financial burden that KCCA must now shoulder from the actions and omissions of the land board is so enormous that it is inevitably resulting into disruption in our ability to fulfill our service delivery mandate,” Musisi explained. Musisi also warned that the pending cases against the land board shall visit further financial exposure upon KCCA, arguing that since the allegations against the board in these cases largely related to double- allocations. “This state of affairs is certainly most undesirable especially in the presence circumstance, where the resource envelope has dwindled, coupled with the face the authority also suffers budgetary cuts during the financial years,” Musisi warned. In 2012, Musisi tried to disband the land board. Her argument, basing on the advice of the Solicitor General that when KCCA came into place, the district land board ceases to exist. To cripple the board activities, Musisi fired Sarah Kasiime, who was then the board secretary and replaced her with Diana Nambi. This forced Nsibambi to drag KCCA and Musisi to court and it blocked her from disbanding it, arguing that under the Constitution is an independent body and is not subject to the direction or control of any person. Since then the two groups agreed to work together. But insiders told PML Daily that during the physical planning meetings at City Hall, attended by land board and KCCA officials, they sharply disagree. “And at times, KCCA officials keep quiet and they don’t contribute much to the discussions,”a source revealed. In 2014, Nsibambi threatened to resign, citing interference from KCCA. At that time, his first term contract was remaining with few months to expire. In 2015, he secured another five year term contract from then Kampala Minister Frank Tumwebaze. At that time, the Lord Mayor Erias Lukwago and his councilors, who are supposed to appoint members of the land board, were not convening. Lukwago had been impeached by the authority, which was dominated by the NRM councillors over incompetency. Not to be sure whether Lukwago will help him to secure another term, sources at City Hall revealed that Nsibambi cut a deal with Tumwebaze. “At that time, Nsibambi and Lukwago were not seeing eye to eye. In fact, Dr. Kizza Besigye, who reconciled them,” a source said. Even before Musisi moved on to try to disband the land board, Lukwago was the first to complain about its activities during one of the council meetings in 2012. While appearing before Parliament, Nsibambi complained of intrigue, engineered by KCCA officials. Nsibambi also explained that they allocate the land, after KCCA surveyors and physical planners have cleared any encumbrances. The 2012 battle to control city land, Nsibambi said Musisi lost it, adding that she is now punching holes in the operations of the land board. “She fired some land board members, who could do the verification exercise. We are also understaffed,” Nsibambi explained. This week, KCCA political wing headed by the Lord Mayor’s office is expected to start probing into the matter. Kennedy Okello, the Nakawa division councilor also said the authority has to probe on how KCCA lost all the cases in court.